Hub Culture is bringing a Paris Pavilion to life for COP21, the United Nations meeting on climate change. The Pavilion will operate from 24 November - 20 December, 2015 and is located in the central area of Tuileries in Paris. Project partners include XPRIZE Foundation, EIT Climate-KIC, People + Planet Project, Ven and Inspirelle. Leaders from non-profits and the tech world are invited to collaborate with Hub Culture on a set of activities focused on climate innovation at the Pavilion. Open daily from 8am - 6pm, the space is set to offer co-working facilities, events, meeting space and smaller roundtables focused on environmental issues, with a calendar of events and activities managed through the Hub Culture Paris online interface. 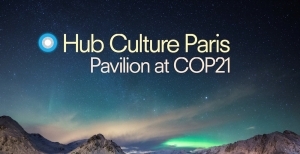 Hub Culture's social media center will broadcast to HubLive.tv from the Pavilion during the course of its operation, and Edelman is partnering to build a newsroom to share news coming from COP21.